I’m going to make a pretty plaid. Thanks for providing a diagram too – I find them much easier to follow! I don’t have plans for making any videos. 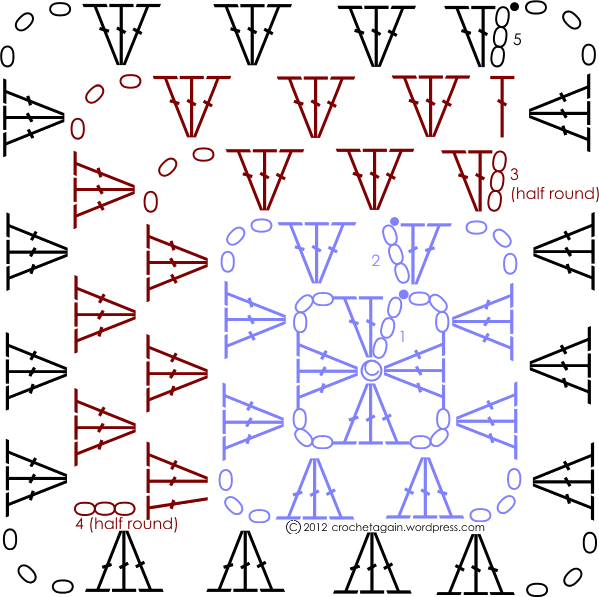 What might help is to find a video on a basic granny square, the miter is just a variation of that. Who created this website? This is brilliant. I used it for a science fair project, because I found myself making a blanket consisting of two colors. However, I need to cite it. Can someone help me? Merci j’aime votre modèle très beau et facile. What a beautiful blanket. 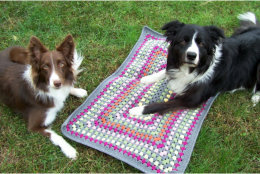 I am trying to make a smaller version, in pink and grey, and a lavender border. Not too sure how to join them yet, and have edged all round just one, as i think I saw that you only do 2 sides but center one all round.I cannot find the photos you put up of joining the squares, any idea, Please. Enjoyed your granny squares. Thank you. Thank you so much, you have inspired me to have a go. I am mainly a machinei knitter! Thanks once again.